Johannes Kepler published the Laws of Planetary Motion in the 17th century. In combination with Newton’s Law of Gravity, scientists still use these laws to determine the motion of objects around a larger object, including planets and suns in other solar systems. These exo-planets, so-termed because they are external to our solar system, have become an area of research in recent years. The primary mission for finding exo-planets is the Kepler spacecraft. NASA launched Kepler in 2009 into an orbit around the Sun. Kepler has only one instrument, a 95 megapixel camera, which originally was pointed at only one location in the sky. The field of view is about 12 degrees in diameter, originally covering e portions of Lyra, Draco, and Cygnus. This field is roughly equivalent to holding a softball at arm’s length. Over Kepler’s original 3.5-year mission, Kepler evaluated 150,000 stars. Kepler looks for the reduction in brightness that occurs when a planet moves in front of (or transits) a star from Kepler’s perspective. Using information about the star and the length of the transit, NASA can determine the orbital period of the planet, distance from its star, and its size. This allows assessment if an exoplanet exists in the ‘Habitable Zone’ of its star. The Habitable Zone is a range of orbits around a star that allows for the existence of liquid water, a prerequisite for life as we know it. Existence of a planet in the habitable zone is not at all indicative of life or even liquid water on that planet. 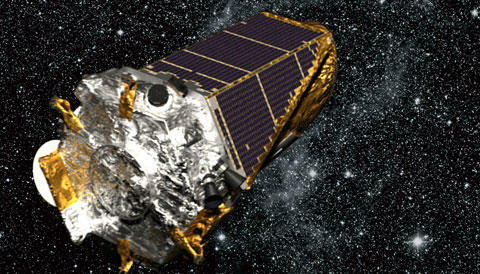 In 2012, NASA extended Kepler’s mission. By mid 2013, Kepler had discovered over 2700 potential exoplanet candidates. However, mechanical issues with two of the gyroscopes that keep Kepler pointed precisely resulted in the temporary shutdown of data collection. In early 2014, NASA announced a technical approach that allowed Kepler to continue searching for exoplanets. This new mission was called Kepler 2 or K2. Kepler 2 looks at much larger areas of the sky, compared to Kepler 1. As of August 31, 2017, Kepler 1 and 2 have discovered 4500 potential exoplanets. 3000 of these have been confirmed. 33 of these are in the habitable zone of their respective stars. Western Slope Skies is produced by members of the Black Canyon Astronomical Society. This episode was written and recorded by Bryan Cashion.